This week, we promote the benefits of healthier, more active lifestyles. It’s Active Aging Week. Eat right and exercise. We’ve heard this message all our lives. But for those over the age of 50, this message is even more important. Countless studies have proven that staying active and eating properly can help older adults achieve a higher quality of life, and it can help them live longer too. Drink plenty of liquids. With age, you may lose some of your sense of thirst. Drink water often to stay hydrated. Limit beverages that have lots of added sugars. Eat your veggies: Include a variety of different colored vegetables at mealtime. Most vegetables are a low-calorie source of nutrients and a good source of fiber. Flavor up your meals: With age, our sense of smell and taste may change. Medicines can also influence how foods taste. A healthy way to add flavor to meals is with herbs and spices. Social eating: Eating alone can be depressing and can lead to a poor nutritional diet. Invite family, friends or neighbors to join you for lunch or dinner a few times a week. Older adults generally need fewer calories. However, their nutrient needs are just as high or higher than when they were younger. It’s why doctors and nutritionists recommend that aging adults plan meals that focus on nutrient-rich whole foods, lots of vegetables, and plenty of liquids. For more advice, check out this helpful information and infographic the National Council on Aging has put together on 6 Ways to Eat Well as You Get Older. If you or your aging loved one is challenged with planning, preparing and consuming a healthy diet, we can help. FirstLight Home Care and our team of amazing caregivers can provide in-home support with meal planning and preparation, eating assistance, and grocery shopping. 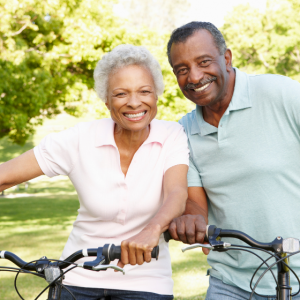 What are you or your aging parents doing to stay fit and eat right? We’d enjoy hearing from you. Feel free to comment below or join our Facebook conversation where we’re sharing tips on nutrition and on staying active and healthy.